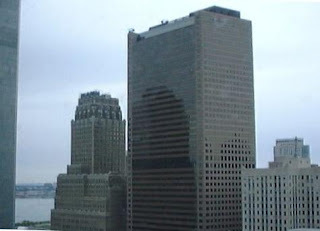 Our research into the initiation event of WTC7’s collapse began with a study of NCSTAR 1-9, where NIST asserted on page 527 (PDF page 593) that the failed girder seat on column 79 on floor 13 was 11” wide. However, we noted that on “Frankel” shop drawing #1091, this seat was 12” wide. This seemingly innocuous discrepancy led us to dig deeper. We read of NIST’s contention that heat had caused five 13th floor beams, framing into a long span girder, to expand. They said that 5.5” was enough to push the girder across its 11” seat on column 79 beyond the vertical web, so that the lower flange of the girder became exposed to the entire weight of that floor area. NIST said that the flange could not support that load and folded upwards. We further noted that NIST said that the 5.5” expansion was the maximum possible expansion. This is because any additional heating would soften the beam, leading to sagging rather than any greater pushing. Thus NIST’s claim of an 11” beam seat and the maximum push of 5.5” were inextricably interwoven. Both had to be true for NIST's explanation to work. When NIST was notified last year about the seat width discrepancy, they issued an erratum document admitting this error in June 2012. However, in that same document they went on to say that they had also spotted another error, and added another paragraph to their erratum document. They claimed that a ‘typographical error’ had been made and that the 5.5" distance should have been 6.25". Apparently they had transposed two figures, said to be axial and lateral expansion figures, and this new erratum document simply reversed them. With the beam seat confirmed at 12” wide and the newly required sideways movement 6.25”, they nevertheless stood by their original theory. We suspect that the original error was caused by NIST carelessly confusing column 81 with column 79. Seen below is their admission that they commingled C81 and C79 modeling data. We discovered that the girder seat on column 81 was 11” wide, according to Frankel shop drawing 1083. Now that the newly required sideways shift distance of 6.25” was confirmed for the acknowledged 12”-wide girder seat, NIST’s earlier contention concerning the maximum heat (600° C.) before the beams would sag would come into question. In our earlier videos we presented our carefully calculated findings that at the temperature required to expand by 6.25”, the beam would indeed have lost much of its strength, and would certainly be sagging rather than pushing the girder. Yet another careless error by NIST was found. While discussing how we should raise this subject with NIST, a member of our team made another startling discovery which moved the entire debate into new territory. Upon close examination of the connection between Column 79 and the girder – a connection that NIST claimed failed – he spotted another steel element in the drawing that had not been previously mentioned. “Stiffener plates” were specified at the end of the girder and welded in place to both sides of the web and to the bottom flange. NIST’s failure to show these stiffeners or take them into account in its analysis is yet another area where the omissions and incorrect statements are so egregious, anyone who understands these issues must by now begin to question NIST’s motives. Basically, these stiffeners brace the end of a girder between the lower load-bearing flange and its vertical web, so that if for any reason the girder did move laterally on its seat, the flange can transmit the extra load to that web and not fold upwards. In effect they make an I-beam end almost into a "box" section. The presence of these stiffener plates was brought to NIST’s attention by structural engineers. The lack of response from NIST has been deafening, until just a few weeks ago. The entire thread can be viewed at http://911blogger.com/news/2013-11-06/nist-replies-stiffeners-inquiry. How can this new information be used to help in the push for an independent investigation of the total free-fall destruction of World Trade Center 7? If NIST’s theory regarding the initiation of the collapse of WTC 7 has now been shown to be faulty, then surely they should revisit and correct their theory, including their entire computerized model (since it requires initiating events that cannot have happened). When a small team of citizen activists can discover major discrepancies and careless errors throughout what should have been the most critical and carefully reviewed part of the entire report, then what confidence should anyone have in the rest of that report, or NIST's other reports about what happened on 9/11? Indeed Architects and Engineers for 911 Truth has documented dozens of other examples of fraud in the NIST reports in our landmark DVD 9/11: Explosive Evidence – Experts Speak Out. We invite qualified individuals worldwide to join us as we continue to expose incorrect statements by NIST in the effort to trigger the initiation of a genuine investigation of the total, near-free-fall destruction of all three WTC towers on 9/11. Anyone who can read blueprints, edit audio or video, make and/or analyze engineering calculations, or write and edit, is encouraged to volunteer to help us. In addition, AE911Truth is seeking funding for various legal actions connected to the NIST reports, such as lawsuits under the Freedom of Information Act (FOIA), claims against the validity of the NIST Reports, and the like. To make a donation to support this vital area of our work, please visit the AE911Truth Donations page, or call the office at 510-292-4710 and leave a message. Note: You do NOT have to have a PayPal account to use PayPal to process your credit card payment. After you complete the brief donation form and select the PayPal option, click Submit and then click the link that says “Don’t have a PayPal Account?” (if you choose to “Donate this time only”) or “credit or debit card” (if you choose to “Become a monthly sustaining supporter”). If you choose to “Become a member of AE911Truth,” the PayPal option is not available, but you can still donate with a credit card, and use the Comments field to let us know that you would like your membership donations to be used to support our legal efforts.